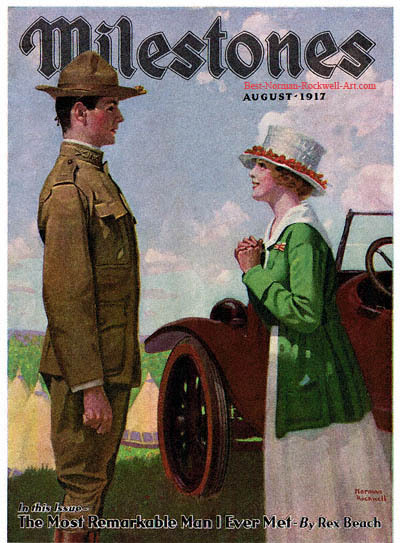 Woman with Soldier, this Norman Rockwell painting, appeared on the cover of Milestones published August 1917. An alternate title for this painting is Woman Saying Good-Bye to Soldier. This was the Rockwell's second cover to appear on Milestones and the last of only two in 1917. Rockwell was only featured on the Milestones cover twice, both times in the summer of 1917. Milestones was the corporate magazine of Firestone Tire and Rubber Company. Rockwell was commissioned to paint this cover by Firestone. This Rockwell magazine cover is an extremely hard to find. In this painting, Norman Rockwell gives us a glimpse of the adage "Parting is such sweet sorrow." This couple certainly looks like a couple of sweethearts. There are several suggestions in the woman's stance that she sees him as a sweetheart. The smiling expression on her face, the way she holds her hands and the way she is subtly leaning toward the soldier all suggest this. The soldier, on the other hand, remains almost at attention. He is not showing any emotion in his posture or expression. Perhaps this is because he is soon going to war. In the background, we see the camp where the soldier will live until he is deployed. Also in the background is the car that the young woman drove to see him. And, of course, those are Firestone tires on the car .